It would be an understatement to say that expectations are sky-high for Assassin’s Creed Origins, the latest entry in Ubisoft’s world-conquering Assassin’s Creed series. Perhaps the most noteworthy thing about Ubisoft’s new game is that it’s set in ancient Egypt, meaning those who get the game will get a chance to climb the Pyramids, sail the Nile and spend some quality time with historical characters like the sultry Cleopatra (who was ruler of Egypt at the time). And as was the case with earlier Ubisoft games like Assassin’s Creed Syndicate, Ubisoft plans to release more content for the game after its launch this October. Actually, the French video game company has revealed its post-launch plans in a new video (see below), in which game director Ashraf Ismail explains what’s included in the game’s season pass, and also reveals the free content that will be made available to owners of Assassin’s Creed Origins. Those who get hold of the game’s season pass (which is also included in the Gold and Dawn of the Creed Collector’s Edition) will be able to download two DLC expansions titled “The Curse of the Pharaohs” and “The Hidden Ones”, which will be available in January and March respectively. According to the video, in The Curse of the Pharaohs protagonist Bayek “investigates a mystery that turns into a living nightmare”, while players will also be able to “discover a large new open world region” when playing this DLC. The other DLC (The Hidden Ones) takes place years after the main game’s story, and in it Bayek “will be involved in a clash between rebel factions and an occupying Roman force”. 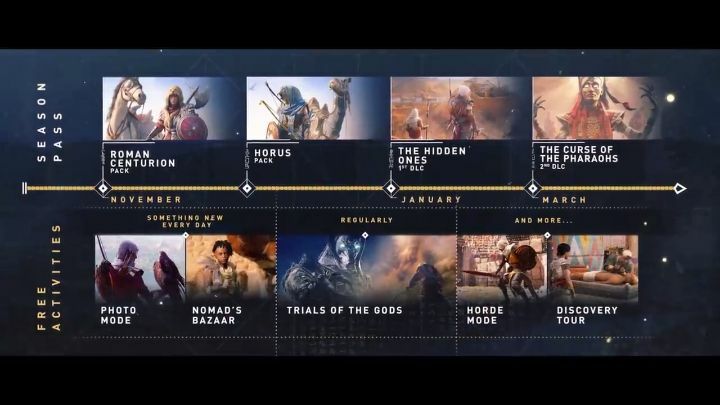 And it’s clear that both these expansions will give players a chance to explore ancient Egypt more, while also enjoying more Assassin’s Creed Origins gameplay. The season pass also includes the Horus and Roman Centurion packs, which offer new outfits for Bayek, as well as new mounts and weapons to use in the game. Aside from the pay-for season pass, Ubisoft also plans to add more free content for Assassin’s Creed Origins, which anyone who gets the game will be able to enjoy. Those eager to learn more about ancient Egypt will likely appreciate the Discovery Tour Ubisoft will be including in the game. Plus, those who love the combat side of Assassin’s Creed will probably enjoy The Trials of the Gods challenge, which pits you against gigantic Egyptian gods in a fight for survival, and also the Horde Mode, which will test your combat skills in the arena. The free content also includes the Nomad Bazar. Here you will receive unique missions each day, and completing these will net you exclusive in-game items. 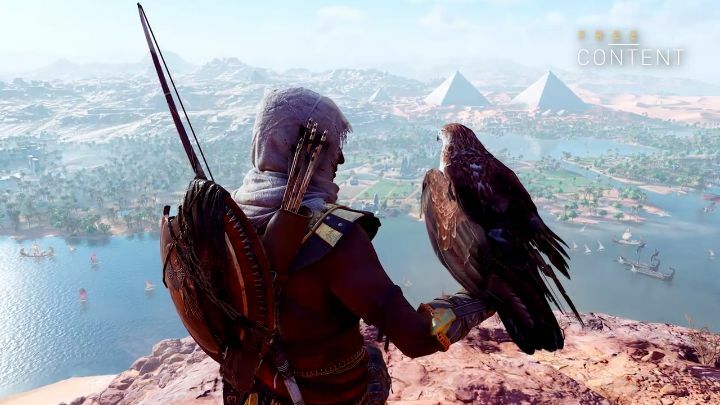 There’s also the Photo Mode, which will let you share the beauty of Egypt and any great sights you come across on your journey with friends online. And while the free content coming to Assassin’s Creed Origins after launch is certainly a good thing, the real question is whether it’s worth shelling out for the season pass, or getting hold of one of the special editions which includes the season pass. Because the thing is that season pass content is rarely up to scratch, almost never matching what’s available in the main game itself, as well as being rather short in length too. Nonetheless, here’s hoping that Assassin’s Creed Origins extra content ends up being a cut above the rest, and a valuable addition to the game when it becomes available next year. For the time being though, what matters is that the game is only a couple of weeks away now, meaning we will finally be able to find out whether Assassin’s Creed Origins truly is the return to form for the series the fans are hoping it will be. Note: Assassin’s Creed Origins will be released on October 27, 2017. Available on PS4, Xbox One and PC.